For the past few years, I’ve used the Welland/Rose City Half Swim/Bike as my regular get ready for Ironman stop on the race calendar. I prefer to save my run suffering and digging deep for Ironman racing, and with my foot injury, that’s even more the case. 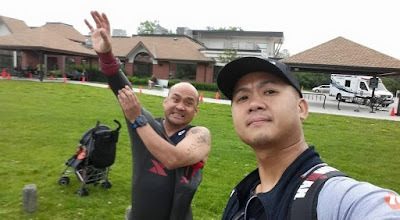 This time though, I recruited a pal (Hong) to do the run for me, and with the added challenge to give him a lead for him to try and stay away from another friend of ours, Sue. Morning prep with my relay partner Hong. It was my first “real” swim since Ironman Mont-Tremblant (August of last year). And I say real swim, because I managed to slip in the water for 800m of swimming the week before at Woodstock. But my shoulders were on fire after 5 minutes. The actual swim did not feel so bad. The shoulders felt tight, especially my left side, but I could sense that I was in the water way too long. Turns out I was, I came out in 50:59. Holy slowness! I can no longer get away with not swimming all year and showing up at an Ironman race and swimming in the 1:20’s any more. I took of my wetsuit just a few feet out of the water, where my relay partner Hong was. He was there with our buddy Wil and we joked of how horrible my swim time was and how I had some work to do to catch our pal Sue. With hardly any bikes left in transition (relays were in the last wave along with athletes 50+), I hopped on my QR Illicito and headed on my way. Knowing that I’d be doing a lot of passing out there. I tried out the new Profile Design FC35 that I got from Running Free. I liked it except for the storage compartment for gels. I got to the mount line and one of my Clif Shot gels popped out. I put it back in but just a few feet down the road it popped out again, and soon after my second gel did too. 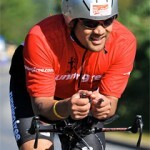 I managed to crank out a 2:29:29 (36.12 km/hr) bike split. 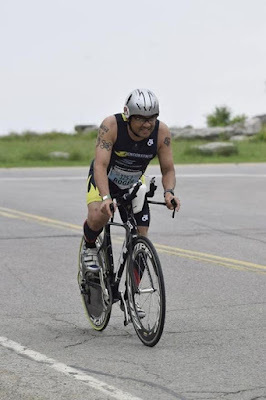 I was certainly happy with that since I was not in any kind of bike shape due to being sick for the past few weeks and I still had a sore throat, and I was coughing and congested on race day. Accelerating off the saddle after making a left turn and the final 25 km stretch back to Welland. I was hoping to provide some power data, but this was my first race with the Garmin Vector pedals and it was clear that the calibration was off. I was pushing hard and my avg wattage was 160w. I knew from my heart rate and by the time and distance I was covering that it was not accurate so I simply hammered and tried reaching each km marker as fast as I could. The Illicito worked it’s magic today as I was only a few minutes off last year’s time, and I was in much better bike shape last year. I was so stiff getting off the bike, and thank goodness I did not have to run afterwards. I am not sure that would have been possible unless I lay down for 10-15 minutes. Luckily, I didn’t have to, my partner Hong took over the reins. Our total time was 5:22:57. Placing us 6th overall so no podium thanks to my turtle-like swim. With the messy weather, we went indoors to the arena, waited for Sue. She crushed her race in 5:06:49. She was the 8th fastest woman, and claimed second in her age group. Awesome! She has put in a tremendous amount of work and it is paying off.